Denver, Nov. 9 (AP) — Dr. Arthur Evans, a Quaker, left the city jail today after serving a 90-day sentence for refusing to turn over his financial records to the Internal Revenue Service. Dr. Evans, a Denver physician, has for years refused to pay that portion of his Federal income taxes that he says is earmarked for military spending. Evans died last year at the age of 89. 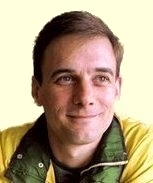 Our hon. treasurer is still at large, and members of Headquarters’ office, and those who kindly volunteer to help with the arduous duties wrestled with there, still have the pleasure of seeing Dr. [Elizabeth] Knight coming and going as usual, in perfect unconcern. The sentence of “seven days” has neither ruffled her serenity nor interfered with the even tenor of her way; and the discharge of her term appears to have receded into the dim and distant future. In this connection we may recall to the minds of our members that the threat of immediate arrest levelled at Mrs. [Charlotte] Despard some two years ago, for non-payment of taxes, has not yet been carried out! Mrs. [Kate] Harvey’s barricade against the tax-collector also remains unbroken, and has in no way hampered her magnificent energy on behalf of the International Suffrage Fair. Probably not one of our keenest observers would, on a casual acquaintance with Mrs. Kate Harvey, discern a fraction of the capacity for organisation and business-like execution possessed by this unassuming woman. Even after many years’ personal knowledge of her and of her generous support of our League in so many ways, this splendid characteristic came as a revelation to me when I called at her residence in Bromley the other day. 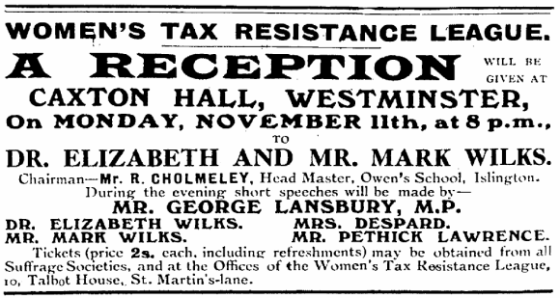 Suffragists will rally in force to greet Mr. Mark Wilks and his wife, Dr. Elizabeth Wilks, at the reception, organised in their honour by the Tax Resistance League, to take place at the Caxton Hall, on Monday, November 11, at 8.0 p.m. The sympathy of teachers with Mr. Wilks’ protest and imprisonment is shown by the fact that the chair will be taken by Mr. R. Cholmeley, Headmaster, Owen’s School, Islington, N. For particulars see page 30. Mrs. [Ethel] Ayers Purdie’s splendid success at Sunderland, single-handed against the Board of Inland Revenue, will be given in detail next week. The Inland Revenue authorities, we understand, intend appealing to the High Court. The goods of Mr. J.A. Hall, of “Glenamour,” on October 31 , Waterloo-park, Lancashire, were sold for the second time against distraint consequent on his refusal to pay income-tax on house property belonging to his wife. The goods were bought in by a friend for the amount of the tax and expenses. Mrs. Hall, who attended the sale in the unavoidable absence of her husband, explained — by the courtesy of the auctioneer — to the large company of sympathisers present that this action was taken as the most practical and emphatic protest possible against the stupid and unjust action of the Revenue authorities who despite the fact of the Married Woman’s Property Act under which she herself is liable for her own debts, had forced the issue under the Income Tax Act of 1842. This Act, whilst making the husband liable for the payment of any tax on his wife’s own income, leaves him absolutely without any power to obtain from her any information with regard to her income if she declines to disclose it. Mrs. Hall emphasised the absurdity and unfairness of such an enactment, and said it was matter for considerable surprise that, quite apart from the merits of the woman’s question, men had not bestirred themselves to force the Government to remedy this utterly impossible state of things and make women, if they could, pay this or any other tax whilst withholding from them the Parliamentary vote.